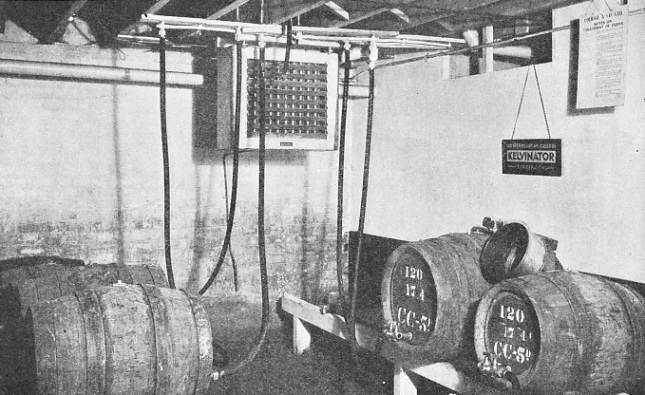 A SUSPENDED REFRIGERATING UNIT of the type used in beer cellars to keep the air cool. The cooling unit consists of an electric fan mounted behind a refrigerated coil. The fan blows air over the coil into the cellar, so that it is continually supplied with cool air. THE term “air conditioning” means the control of the temperature, humidity, movement and purity of the air in an enclosed space. The enclosed space may be a railway carriage, a cabin in a ship, a factory, a mine, an office, a hospital, a cinema, a restaurant or a house. Within this enclosed space the air can be conditioned to requirements irrespective of the weather outside. The various items of a complete air conditioning system such as air filters, ducts, fans, humidifiers and dehumidifiers, heating plants and refrigerators have long been in use, but individually they do not perform the entire operation of air conditioning. It is the recent co-ordination of the various items into comprehensive systems of controlling the air inside an enclosure that constitutes air conditioning. By the air conditioning of carriages in a railway train that is travelling from one climate to another, or crossing a torrid desert, heat and cold can be prevented from causing the passengers discomfort, and dust and dirt can be excluded from the carriages. In a factory the conditions best suited to the article being manufactured can be produced and maintained consistently throughout the year. In a cinema, restaurant or house the air can be controlled so that there is no discomfort when the building is crowded or the weather is hot or cold outside. The window, which is essential to the ventilation of the ordinary building, is not used by a complete air conditioning plant. In some systems the air inside the building is at a slightly higher pressure than the air outside. Air is drawn by fans into the conditioning plant, cleaned, warmed or cooled, moistened or dried, distributed throughout the building by supply ducts and grilles and collected from various sources by other ducts and grilles. To industry this air conditioning is important because it makes the manufacturer independent of the vagaries of the weather. In many industries the humidity of the air is of paramount importance because of its effect on the article being manufactured. One such industry is textiles. The locating of the cotton industry in Lancashire and on the seaboard of the New England States of America was primarily due to the dampness of the atmosphere which enabled cotton goods made there to be far superior in quality to those manufactured in places having dry air. Even in these favoured localities, however, the difference in the quality of cloth made on damp, muggy days from that produced on dry, fine days was so marked that artificial means of moistening the air were introduced long before air conditioning, as it is known to-day, came into being. A CENTRAL STATION AIR CONDITIONING SYSTEM is one in which the air for the whole of a building is controlled by one set of machines. 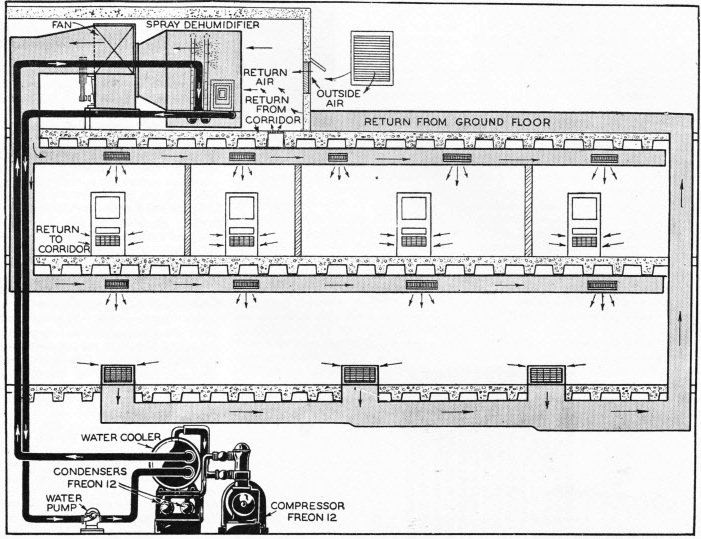 Sometimes all the plant is installed in the basement; sometimes, as shown in the above diagram, the conditioning apparatus is apart from the refrigerating plant. The refrigerant used in this system is a chemical known as “Freon 12”. Conditioned air enters rooms at ceiling level and leaves at floor level, to be returned to the apparatus by a duct from the ground floor. Artificial silk factories and tobacco factories are among the industries which require a humid atmosphere, as dry air makes the products brittle. In some industries static electricity is produced when the air is dry, causing magnetism and sometimes the risk of fire due to sparks. These troubles are overcome by increasing the humidity of the air. In the laboratory uniformity of temperature and of humidity is essential. Research workers who made sure that the temperature of the laboratory was constant were puzzled by variations in the results of tests until they controlled the humidity of the air. Rand, South Africa, air conditioning plant has been installed to enable miners to work at depths hitherto impossible. In the last few years thousands of railway carriages, principally on United States railways, have been air conditioned. The heating of carriages is easy compared with the problem of cooling them, eliminating draughts and keeping out dust; the great advance made in solving these two difficulties has enabled long-distance expresses and railcars to meet the competition of other methods of transport. Electrically-driven compressors supply refrigeration through conditioning units which filter the dust and dirt from the air and deliver clean, cool air through ducts on either side of the carriages. When a train passes from a warm into a colder climate the air is warmed by being passed over heating coils and the carriage also is warmed by steam heat. Air conditioning has eliminated stuffiness and draughts and has ended disputes as to whether the windows of a compartment should be closed or opened. As the difference between summer and winter temperatures is much greater in the United States than in Great Britain, and the air is much drier, the cooling and heating of buildings in these countries have progressed on different lines. Central heating is the normal method of warming buildings in the United States, the furnace and boiler being situated in the basement of a building. The air conditioning engineer has made use of some of this plant to cool buildings in summer, and by adding air-washing and humidifying and dehumidifying devices has added to the comfort of the residents. Some of these systems use well water, water from city mains or ice; other systems incorporate refrigerating plant. Another method is to install portable self-containei units in rooms and offices. Each application of air conditioning to buildings is a matter of applied engineering, and the type and scope of the plant is fitted to requirements. The self-contained units which are used in offices and rooms do not control the atmosphere with the accuracy of the complete systems which are incorporated in new buildings, but they are effective and are no more trouble to operate than a radio set. The unit is enclosed within a cabinet and can be used in any room. There are many types from which to choose and the details vary according to the practice of the manufacturers, but the general principle is common to all. These units contain a refrigerating machine operated by an electric motor in one compartment with the air-conditioning apparatus in another. Some units can be wheeled from room to room as required. 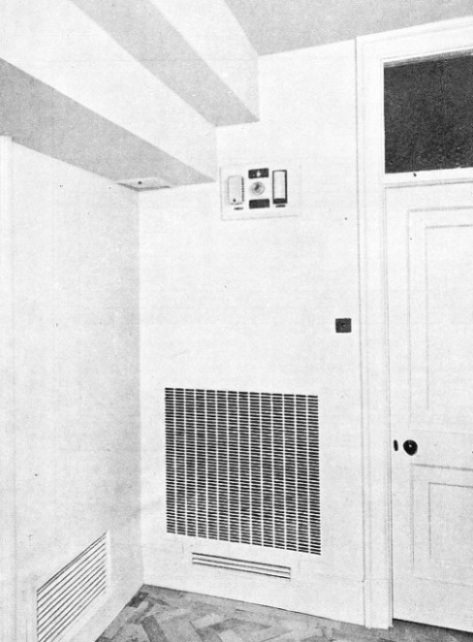 A unit of this type, such as the York portable air conditioner, is wheeled into position next to a window. The machine is connected to the window by an adapter, which contains the fresh air inlet and the condenser air suction and discharge ducts. The conditioner is connected with the electric power plug installed in the room, and the current starts the refrigerating machine and the fans in the unit. The supply of outdoor air is regulated by an adjustable damper in the fresh air inlet. The air from the room is sucked in through a grille in the right-hand side of the cabinet. The conditioning fan recirculates room air continuously over the cooling surface and through the room air filter, after which it is mingled with outdoor air drawn in through the fresh air filter. The cool, dehumidified, filtered fresh air is discharged vertically from the outlet grille in the top of the cabinet and is diffused evenly and without draughts throughout the room. The cooling surface is part of a complete refrigerating system which includes the refrigerating machine, condenser surface and motor. The condenser air fan, connected to the motor, circulates outdoor air over the condenser surface, absorbing all the heat and moisture extracted from the room by the cooling surface. Humidity from the room air, collecting in drops of, water on the cooling surface, drips down on to the condenser surface, where part evaporation absorbs heat and helps to reduce requirements. Part of this water is not evaporated and drops to a pan in the bottom of the cabinet, where the rotary vaporizer diffuses it in the condenser air stream in which, as a vapour, it is discharged out of doors. Another self- contained unit is the Kelvinator water-cooled room cooler, which is enclosed in a steel cabinet heavily insulated to prevent the transmission of noise and to prevent condensation on the outside of the cabinet. The unit is connected to the electricity supply of the room and to the water supply and the drainage. The cabinet is in two compartments, the lower-housing the refrigerator and the upper the conditioner. Air is drawn in through an intake grille in the side of the cabinet and passes through the air filter and then to the cooling coil, where it is cooled and dried. After this the fan drives the air through the outlet grille in the top of the cabinet and into the room. GRILLE AND CONTROL PANEL in a room supplied with conditioned air. The switchboard enables the occupant to control the condition of the air. The controls consist of a thermostat, a humidistat, and a switch that changes over the system from cooling to heating or the reverse. A pipe carries the refrigerant from the condensing compartment to the cooling coil in the upper compartment, and the supply of refrigerant is controlled by a float valve, which is in the condensing chamber and is cooled by a water jacket. The lower chamber is virtually airtight, and the heat of the motor in this compartment is absorbed by the condensing water in a water coil. A high-pressure cut-out switch protects the condensing unit against water failure, and there is a thermal overload device in the starting switch. The motor which drives the fan has a two-speed control to enable the capacity of the unit to be varied according to existing requirements. Cooling and dehumidifying the air by a refrigerating machine and fans, although not air conditioning in the complete sense of the term, are extensively used to cool beer cellars and places where cooling is the main consideration. Suspended type units are used. These are cooling fans which work in connexion with a refrigerating machine. An electric fan is mounted behind a coil housed in a casing. Refrigerant is supplied to the coil by the refrigerating machine. When the fan is set in motion it blows air over the coil and thus the air is cooled. When large buildings are air conditioned throughout, the plant is generally located in the basement to work in conjunction with the central heating system. When refrigerating machinery is used the air conditioner is often located near this; or the conditioner can be placed elsewhere in the building. In a central station installation the air is conditioned and supplied to the rooms by ducts. The air enters the room through a supply grille and passes out through a return grille; it is drawn through the return ducts to the basement. A separate duct draws fresh air from outside the building to the plant. The supply and return ducts act as pipes supplying air to the building and collecting used air, in the same way as water pipes. An alternative system has a number of conditioners situated in the rooms or on the floors to be air conditioned. Cooling or warming water is pumped from the basement to these remote conditioners. In a London block of flats there is an interesting air-conditioning system. To prevent noise the refrigerating machines are mounted on antivibrators, which are fixed on a perforated iron grille extended from each landing. The air conditioners in the kitchens of each flat are mounted on compressed felt pads, the fan and motor being insulated from the casing of the conditioner with compressed felt washers. The ducts are designed for low velocities, and are fitted with sound-absorbent baffles. The conditioners occupy a floor space of only 3 feet by 2 feet. Each conditioner changes the air in the flat about twelve times every hour. When the air is required to be warmed, hot water is supplied from the central boiler plant to the conditioner. The air-delivery duct is carried from the conditioner at a high level with branch ducts to the rooms, each duct delivering the air to the room through a diffuser grille placed at a high level. The return grille is at a lower level. Although the plant is automatically controlled, each tenant can adjust it to suit himself. 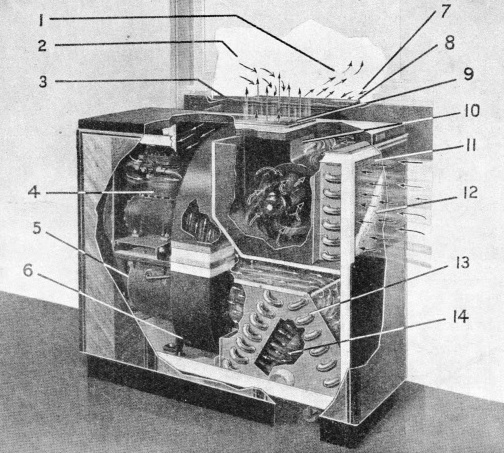 The controls are on an instrument board placed in the hall, and consist of a thermostat, a humidistat, and a change-over rotary switch from cooling to heating or the reverse. The refrigerant used in these units is “Freon 12”, the chemical name of which is dichloro-difluoro methane. It is not poisonous, does not explode, is non inflammable and has no harmful effects on furs, flowers or food. The discovery of a safe refrigerant has been an important step in the application of small units to offices, shops and homes, as if a leakage occurs the consequences are not harmful. There are various methods of cleaning the air. One is to pass the air through the baffle plates of a filter, while an oily liquid is circulated over the plates tc collect the dust from the air and prevent it from clogging the plates. Another is to bring the air into contact with fine sprays of water and wash out the dirt. The cleansing of the air is so effective that sufferers from hay fever are immune in air-conditioned rooms, as the pollen which causes the complaint is removed from the air. When air conditioning is applied to industries which produce harmful dust the effect on the health of the workers is beneficial. When more industries apply air conditioning it is anticipated that certain industrial diseases caused by harmful dust will cease to exist. The capacity of the large plants installed in public buildings and large stores is huge, these installations requiring miles of ducts and the treatment of millions of cubic feet of air every hour. Flexibility in the operation of a large plant is obtained by fitting by-pass controls. Government offices in Washington, the capital of the United States, and banks and commercial offices have found that air conditioning adds to the health, comfort and efficiency of their staffs.